How to Select Commercial Carpet. Expert Advice. A perfectly selected commercial carpet. It's durable. The color is practical. And the waiting room looks great. There are five main concerns you should have when choosing a commercial carpet for your business. Is the carpet Suitable for the area? Is the carpet Easy to Maintain? Those are the main concerns. You will also have other concerns, such as how quickly can you get the carpet, will you need to close for the carpet installation, can the carpet be done in stages to minimize the impact on your business, etc. These logistics can best be coordinated with your carpet store. The following can get technical, but is well worth it if you want to get the most from your investment in commercial carpeting. Carpet is rarely the source of fire. However, it can be involved once a fully involved fire has started in an area. Here is the simplified version of the two fire ratings you need to know about. The first is the NBS Smoke Chamber Test. Smoke is often the most lethal part of a fire, so having materials in your business that reduce smoke in the event of a fully involved fire is important. All carpets must have an NBS Smoke Chamber Test of 450 or less, or it can not be legally manufactured in the United States. This includes all commercial and residential carpet. If the carpet is for sale, it needs to pass this test. The second fire rating is the ASTM E-648 Radiant Panel test. For commercial carpet, the results of this will be either Class I or Class II. Typically, Class I should be used in corridors, entrances, and exits of health care facilities (hospitals, nursing homes, etc) as well as new construction (not existing) correctional or detention facilities. Class II can be used everywhere else, including exits, entrances, corridors of hotels, retail space, day care centers, schools and apartment buildings. Note that local building codes can supercede these requirements. Areas that could be exposed to chemicals (i.e., chlorine dripping from bathing suits). For some areas, carpet may not be suitable at all. Businesses get much more traffic than domestic areas like homes and apartments. When you are carpeting a business, you need durable. There is a special class of carpet called commercial carpet that is designed specifically for the extreme traffic that businesses get. There are three factors you need to address to be sure your carpet will be durable. 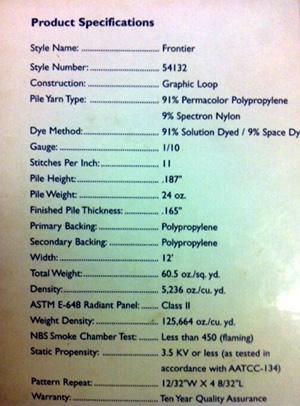 Typical specifications for commercial carpet. You can get specifications for the commercial carpet you are considering. Many stores and manufacturers will tell you face weight. Face weight is indicated in ounces of yarn per square yard. Typical numbers for commercial carpet can range from 16 ounces per square yard to 40 ounces per square yard. Face weight may also be called pile weight. Face weight is NOT density. It is imperative to understand this to be sure you are selecting a suitable carpet for your business. Why? Because we can take an amount of yarn and make it short but tight together, or we can take the same amount of yarn and make tall, but loose and fluffy. The short, tight pile will be much more durable even though it has the same face weight as the other carpet. The photo to the right shows a typical product specification for a popular commercial carpet. It tells us that the pile weight is 24 oz. per square yard. But we now know that is not what we want. So we keep looking and find another figure called "Density" listed at 5,236 oz. per cubic yard. You will note another number listed as weight density, but that is not what we want. The number you want should have a range somewhere between 2,000 and 10,000. For commercial carpet, the range starts around 4,000. What if I can't find pile density? Pile density can also be calculated if you know pile weight and pile thickness. Density = pile weight X 36 / pile thickness. Pile weight will be in ounces per square yard. Pile thickness will be in inches. For instance, using the photo to the right, we calculate density as Density = 24 * 36 / 0.165 = 5236. Now that we have the cubic volume density of the carpet pile, what do we do with it? Here is a guideline for pile density. 4,000 and higher. Moderate Traffic. 5,000 and higher. Heavy Traffic. 6,000 and higher. Extra heavy traffic. 7,000 and higher. Super heavy traffic. These ratings would be for loop pile commercial carpet. 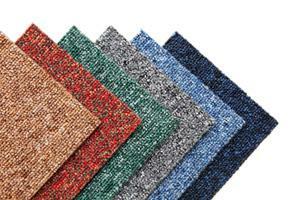 If you are selecting a cut-pile commercial carpet, add 500 to each of the numbers. You need higher density to get the same durability from a cut-pile carpet. Loop pile carpets are more durable. Caution: We are rating commercial carpet. Do not make the mistake of using this to rate carpet for your home. Commercial carpet will be low and hard. That is NOT what you want for your home. This chart is a guideline only. Some situations are special cases for which you should seek professional advice. An airport corridor, for instance, has stupendously high traffic, rolled luggage, dragged luggage, wheelchairs, and light duty vehicles. This is a very special situation that no chart will ever encompass. 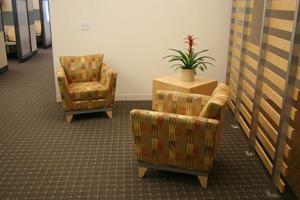 Heathered colors in commercial carpet are much more practical than solid colors. Not matting is only one part of selecting a durable commercial carpet. You also need to select a sensible color. If you select a carpet rated for Super heavy traffic, but the color is white, we are headed for disaster. Very light colors will show soiling. On the other hand, very dark colors may be great at hiding soiling, but may show lint. Medium to darker-medium colors work best for most businesses. Please note the color of the soil in your area. If your business is located on the beach and people are dragging in light colored sand, then a lighter color may make more sense for you. For our main service area, we have dark loamy soil. This soil imparts a yellow-ish hue when combined with most carpet colors. Use the following chart in this case. Why is green practical but blue impractical? Because soil adds a yellow tint to blue, causing the traffic areas to turn greenish (dingy). Green already has yellow in it, so it still looks good even if soiled somewhat. Whenever we add pattern or heathering to a carpet, we increase its ability to hide soil and traffic patterns. By definition, commercial carpet should be easy to maintain. They are made flat and dense so they vacuum easily. If you have done a good job selecting a durable commercial carpet in a sensible color, you will have a commercial carpet that is easy to maintain. Commercial carpet is designed to be durable and easy-to-maintain while reducing cost. What we give up to get this is luxury. Commercial carpets are not thick plushes. This helps keep costs down. However, you can keep costs down by not buying more carpet than you need. A gift shop that gets several customers a day does not need the same carpet as a busy restaurant. Patterns can also cost more than solid or heathered tones. So giving up a designer style may help reduce your carpet budget. Is the Commercial Carpet Attractive? Years ago, commercial carpet might have been a synonym for "ugly". Thankfully, this is no longer the case. 50 years ago, your choices were limited and the color you could select was an ugly brown. You now have hundreds of choices, hundreds of colors, and lots of patterns available. The right style for your business will be determined by . . . you.